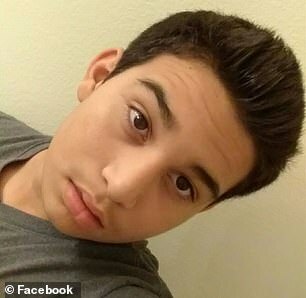 Police in Arizona have released body cam footage showing the moment one of their officers fired multiple shots and killed a 14-year-old boy as he was running away. Baby-faced Antonio Arce was carrying a replica handgun and breaking into a car when he was shot in the back from 50 meters away on Tuesday by an officer identified only as Jaen, according to cops. The boy's devastated family have called for justice and around 100 people held a vigil outside the Tempe police headquarters on Thursday. The footage shows Jaen, an officer for 17 years, arriving in a car and parking in an alley to investigate the reported burglary. He sees the suspect in a gray pickup truck facing his squad car and crouches behind a big, black plastic trash barrel before calling out 'hey' and raising his handgun. The suspect then gets out of the passenger side of the truck and starts running down the alley lined with wooden fence, chain link and concrete block. The video does not show the suspect - who does appear to be holding something in his hand - again after he disappears from view. She asked people to withhold judgment until an investigation is complete. Moir said one of the two shots hit the teen in the rear shoulder blade area and the other hit a wall. He died at hospital. Jaen, who has completed one combat tour in Iraq for the Army National Guard, is now on administrative leave. There has been at least one other police shooting that killed a teen in Arizona's largest county since the beginning of the year. A Phoenix police officer shot and killed Jacob Michael Harris, 19, after surveillance officers reportedly saw him and three others carry out an armed robbery. An investigation into the shooting has been launched in conjunction with prosecutors, which is customary in officer-involved shootings.